“The global economy is growing, but so is uncertainty. This column presents a new quarterly index of uncertainty for 143 countries. The World Uncertainty Index reveals how uncertainty in the world has evolved over time, whether it is synchronised across countries, and how it compares across income groups and political regimes. The October 2018 edition of the World Economic Outlook predicts that global economic growth will remain steady between 2018 and 2020 at the 2017 growth rate of 3.7% (IMF 2018). This exceeds the growth rate in any year between 2012 and 2016. So, the global economy is growing, but so is uncertainty. Headlines that have appeared in the Financial Times in 2018 include: “Stocks unsettled by global trade uncertainty”, “Counting the costs of Brexit uncertainty”, “Latin America faces up to growing uncertainties”, “Italian bonds under pressure from budget uncertainty”, and “Boeing deal with Embraer faces political uncertainty”. A Google news search for “uncertainty” gives about 0.6 million results for the whole of 2017, but 2.5 million results for the first ten months of 2018. Can we measure ‘uncertainty’ more precisely? Or compare the amount of ‘uncertainty’ in the US to that in China, the UK, or Ireland? Measurements of economic and political uncertainty have been made only for a set of mostly advanced economies (Baker et al. 2016). We have constructed a new index of uncertainty for 143 countries using Economist Intelligence Unit (EIU) country reports. To the best of our knowledge, this is the first effort to construct a panel index of uncertainty for a large set of developed and developing countries. We constructed the World Uncertainty Index (WUI) – a quarterly index of uncertainty – for 143 individual countries from 1996 onwards. 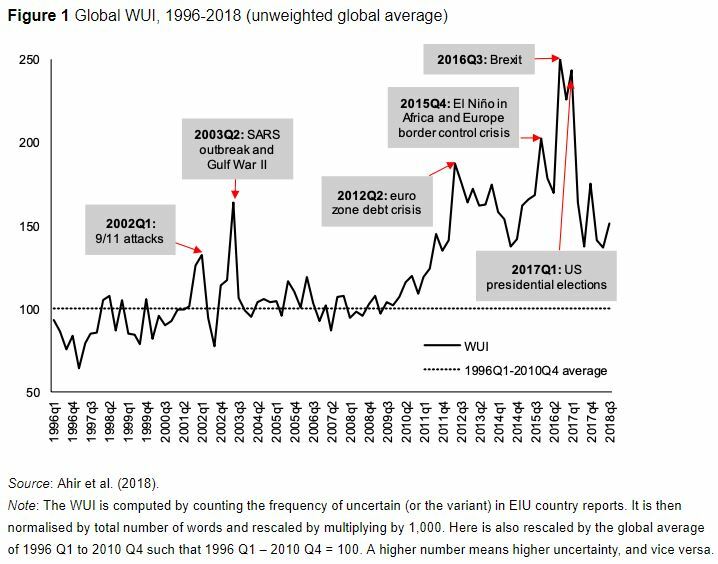 The WUI is defined using the frequency of the word ‘uncertainty’ (and its variants) in the quarterly EIU country reports. To make the WUI comparable across countries, the raw count is scaled by the total number of words in each report. The WUI is based on a single source. This source has specific topic coverage – economic and political developments. Reports follow a standardised process and structure. The process through which the EIU country reports are produced helps to mitigate concerns about the accuracy, ideological bias, and consistency of the WUI. But we only have one EIU report per country per quarter, meaning there is potentially quite large sampling noise. 1. Global uncertainty has increased significantly since 2012. Figure 1 shows that average uncertainty has increased since 2012, well above its historical average (computed between 1996 Q1 and 2010 Q4). The index spikes near the 9/11 attacks, the SARS outbreak, the second Gulf War, the euro area debt crisis, El Niño, the Europe border-control crisis, the UK referendum vote for Brexit, and the US presidential elections. Interestingly, while text-based measures of uncertainty have been rising since the early 2000s, financial market measures rose until about 2010, but have fallen back to low levels (Pastor and Veronesi 2017).